How to Transfer Apps from Samsung to Samsung? Home > Resources > Transfer > How to Transfer Apps from Samsung to Samsung? So you just have the honor of being one of the millions of Samsung Galaxy S5 owners and be ready to give away your old Galaxy S2 or S3. However, it can be difficult to setup your new Samsung phone at the beginning because all your favorite apps are still there on your old Samsung phone. You just don't want to re-download these apps again, therefore, how to transfer all apps from your old Samsung phone to the new one is a question interfere you so much. Here is the small tip you can learn to easily share apps between Samsung phones with just one click. 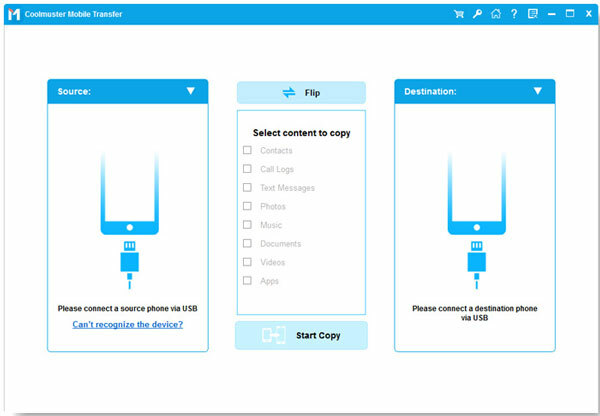 All you need is the Coolmuster Phone Transfer, which is specially designed to transfer not only apps, but also contacts, text messages, call logs, music, videos, photos and more from one phone or tablet to another. Within a few mouse clicks, all your apps on your old Samsung Galaxy S2 or S3 will be moved to your new Galaxy S5 or S6 with ease. Free download the Coolmuster Phone Transfer via the following button. Then, read the guide below to learn more. To get started, download and install the phone transfer from the above link. Then, run it on your computer and it will show you its primary interface as following. 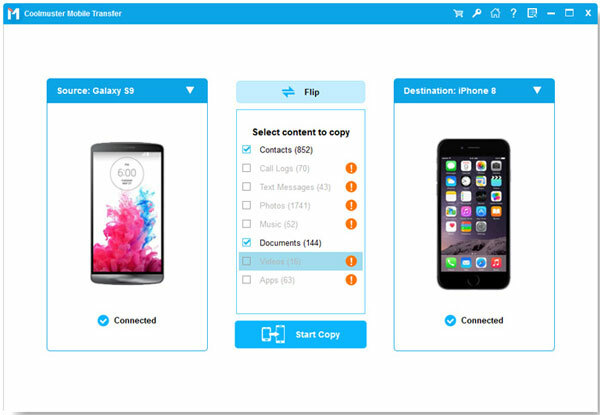 The Phone Transfer can help you transfer all data including contacts, text messages, call logs, music, videos, photos and apps from one phone to another. If you just want to transfer apps, you should remove the marks before other items and click the button of "Start Copy" to start transferring all apps from your old Samsung to new Samsung phone. That's all! Now you can check the exported apps on your new Samsung phone and enjoy them!